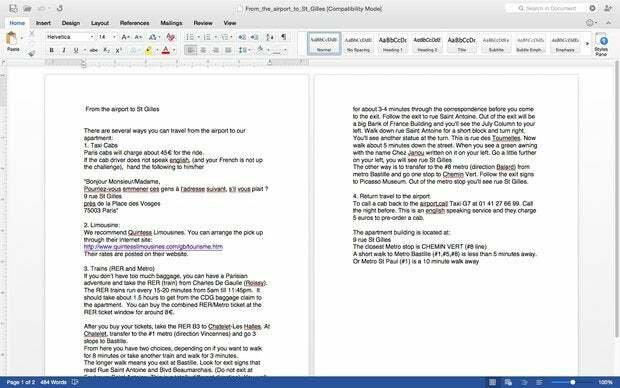 Mac users who've been waiting for Microsoft to update Office can take heart: The new version is finally here and it's worth the wait. Mac users of Office who have felt left out in the cold by Microsoft (because the last version, Office 2011 for Mac, was released in October 2010) now have reason to be pleased: The final version of Office 2016 for Mac brings the suite out of the dark ages and into the modern world. Hints of what the new Office would offer have been out for quite a while, notably the preview of Outlook, introduced in October 2014. But Mac owners had to wait until early July for the final release of the full suite, including the core applications Word, PowerPoint and Excel. It was well worth the wait. Office 2016 for Mac sports a far better interface than Office 2011, integrates well with Microsoft’s OneDrive cloud storage and dramatically improves Outlook. The moment you run any Office application, you know you've left the aging Office 2011 behind. It's less cluttered, cleaner and sleeker-looking, more logically organized, more colorful and simpler to use. That's largely in part because the Ribbon has been redone, and now looks and works as it does in the Windows version of Office. The Ribbon is far more prominent and now sits close to the top of the screen rather than (as before) beneath a long row of icons for doing things such as opening and closing files, printing and so on. The usual Mac menu that sits atop Mac applications is hidden as well, although you can reveal it by moving your cursor to the top of the screen. It's a clever way to bridge the worlds of Office and Mac OS X. Not everyone is a Ribbon fan, though, and those who wish it were gone, or just want to give themselves a little more screen real estate, can hide it by clicking a small up arrow at the Ribbon's far right. The Ribbon goes away and the arrow turns to face downwards. Click the arrow to make the Ribbon come back. Not only has the Ribbon been moved but it's been reorganized, which is all to the good. For example, Word's confusing Document Elements tab is gone; most of what was there can now be found in the more logically-named Insert tab. So now, you use the Insert tab when you want to insert anything, whether it be art, a table, header, link and so on. In Office 2011 you had to go on a treasure hunt through many different tabs to find all that. You'll find similar reorganizations throughout all of Office. For me, this reorganized Ribbon has made Office more usable and far more pleasurable to use than the previous version. Also, I use the Windows version of Office, and because the Mac version now closely mirrors it, I found switching between Office on Windows and Office on the Mac to be largely seamless. In Office 2016, Microsoft is bringing a common look and feel to the suite across all platforms, which is why this Mac version looks much like the recently released Windows-based Office 2016 IT Pro and Developer Preview. However, there are still some differences between the Mac version and the Windows Office preview. As with the Windows 2016 preview, on the Mac the applications are color-coded: Blue for Word, green for Excel and red for PowerPoint. Also missing in the Mac version is one of the more useful features of the Windows version: A box on the far right of the ribbon with the text, "Tell me what you want to do." Type in a task, and you get walked through doing it via options and menus. I found that exceptionally useful, and hope that Microsoft eventually introduces it in the final, shipping version of Office 2016 for the Mac. Another difference: The Ribbon doesn't have the File tab. In the Windows version of Office, when you click the File tab, you're sent to what Microsoft calls Backstage, for doing things such as opening a file, viewing cloud-based services associated with your accounts and so on. That's missing in the Mac version. You can do some of what Backstage offers in the Mac version -- for example, you can open files by either clicking on a folder icon just above the Ribbon on the left-hand side of the screen or by pressing the Command-O keyboard combination. But that still won't offer other Backstage capabilities, such as controlling what changes people can make to a document. In the Mac version, you do that in the Review tab. And I couldn't locate two other features of Backstage anywhere in the Mac version of Office: Checking a document to see whether it contains hidden personal information and managing previous versions of a file. It may be that they're hidden so deeply I couldn't find them. But it's a shortcoming of the Mac version of Office, even if it's only a minor one. Microsoft has been integrating its cloud-based service OneDrive into both Windows and Office, and so, as you would expect, access to OneDrive is built right into Office 16 for the Mac. You have a choice of opening or saving files either to the cloud-based OneDrive or on your Mac's hard disk. It took me a little while to get used to the somewhat confusing OneDrive interface. When you choose File / Open or press Command-O, you see a screen that is clearly designed to be like every other Office screen, with the same colors, size of icons and so on. You then have the choice of opening a file on OneDrive or on your local Mac. If you choose to open a OneDrive file, you get the same Office-like interface. However, if you choose a Mac-based file, you’re switched to the Mac’s Finder interface and have to use it navigate to files stored on your local version of OneDrive. Using two different interfaces to open files is jarring at first and takes getting used to. However, after a few times I got used to dealing with it. You likely will as well. As with the other Office applications, the main thing that's new about Word is the interface. But there are other changes as well. There is now a somewhat awkward collaboration feature that lets two people work simultaneously in the same document. In theory it sounds nice; in practice, I wasn't impressed. You don't see the changes your collaborator makes until she saves the document, and she won't see your changes until you save it. That's not exactly real-time collaboration. Nice try, but I won't be using the feature any time soon -- Google Docs is far superior in this area, because it uses true real-time collaboration. Word and the other Office applications get the full-blown ribbon treatment in Office 16 for Mac. On the plus side, there's a new Styles pane that lets you apply pre-set styles to text and paragraphs. It's easy to overlook, because it's available only on the Home tab. To use it, go to the Home tab and click the Styles Pane icon on the upper right of the screen -- and the pane appears. Click the icon again to make it go away. Word 2016 also adds another useful new pane, the Navigation pane, which lets you navigate through a document via search results, headings and page thumbnails. You can also navigate by the kinds of changes you've made to the document, such as comments and formatting. One of the most welcome additions to Excel is that it now recognizes most Windows keyboard shortcuts. But don't worry -- there's no need to abandon the old Mac Excel shortcuts, because it recognizes them as well. Being a long-time Windows Excel user, I found this saved me a great deal of time on the Mac. It was like coming home. Excel now comes with new data analysis and charting features. Spreadsheet jockeys will be pleased that Excel has been powered with many of the features from the Windows version, such as adding slicers to pivot tables. With slicers, you create buttons that make it easy to filter data in a pivot table report, with no need to resort to drop-down lists. A number of new statistical functions have also been added, such as moving averages and exponential smoothing. Less importantly, when you click on a cell, your cursor essentially glides over to it in an animated way, like it does on the Windows 2013 version of Excel. Will this change your life? Far from it. But I found it just the slightest bit entertaining, and I, for one, can use all the entertainment I can get when I'm using a spreadsheet. Not everything is rosy in this new version of Excel, though. You can't build pivot charts in Excel, which is unfortunate, because they're a great way to present complex information at a glance, and are useful when creating dashboards meant to display a great deal of data at once. PowerPoint has gotten the same kind of collaboration features as Word and suffers from the same limitation --- it's not true real-time collaboration because changes don't show up until the person you're collaborating with saves them. The new Presenter view may be PowerPoint's best new feature. On the plus side, I found the new Presenter view an excellent addition. With it, while you're projecting a presentation, your audience will see the current slide, while you'll also see your notes, the next slide and a timer. That makes it easy to read from your notes and know what's coming next when giving your presentation. A new animations pane is useful for creating and previewing animations in your presentations. I found it exceptionally useful because it let me control pretty much everything about animations in slides, including customizing the duration of the animation, whether to play sound along with it, and a number of effects options. And it's also great for adding multiple animations to a slide, because you can use the pane to easily change the order of the animations, delete animations and add news ones. If you feel that Apple Mail is purgatory, Outlook 2016 will be a must-have. As with the other applications in Office 2016, Outlook has gotten a visual makeover to make it look and work more like its Windows counterpart. Clutter has been reduced, although it still relies on a menu above the ribbon for many tasks. Outlook has a new look, but more important may be performance enhancements under the hood. Unread messages now are denoted by a blue vertical bar rather than by bold text, making them stand out much more. As a result, I found it much easier to scan unread mail in my inbox. Links to your calendar, notes, contacts and tasks are no longer buried underneath the mailboxes on the left-hand pane, but instead appear in big type at the very bottom of the screen. They're now impossible to miss. Performance has been considerably improved. Messages appear instantly, search is quick and I experienced no lags or delays. Microsoft says that's because it's switched from its previous proprietary database to SQLite. The company also says this makes Outlook's database not just faster, but less liable to crashes and corruptions. You receive messages faster on an Exchange account not just because of the new database, but because in the old Outlook for the Mac, Exchange Web Services polled the mail server for new messages approximately only once a minute. Outlook 2016 has done away with that delay -- it now polls continually. That's not to say all is well with this new version of Outlook. You can't export mail, tasks, contacts, notes, and calendars directly from Outlook. Because there's no support for CalDAV or CardDav, you can't sync your contacts or calendars with other programs and platforms, including Outlook.com. And because Outlook supports Apple's sandbox, you can't run local anti-spam products in Outlook 2016 with Exchange. Instead, you have to use an Exchange server-based anti-spam product from Microsoft. There are currently two versions of Office 2016 for Mac available, both as part of the subscription-based Office 365 line. Office 365 Home costs $9.99 per month and covers up to five Windows PCs or Macs along with five tablets and five phones; Office 365 Personal costs $6.99 per month and covers one Windows PC or Mac, one tablet and one phone. There are also several business and enterprise plans available. When the standalone version of Office 2016 for Mac is released later this month, it will be essentially the same suite as the Office 365 version, with two differences: The standalone version won’t include either a free 1TB of OneDrive space or 60 minutes a month of free Skype calling, both of which come with Office 365. Aside from that, though, the suites will be identical. With this version of Office, the Mac is no longer the poor stepchild in the Office world. All versions of Office, whether on a Windows PC or a Mac, look and work alike, and also resemble the Office you experience on the Web and on tablets. 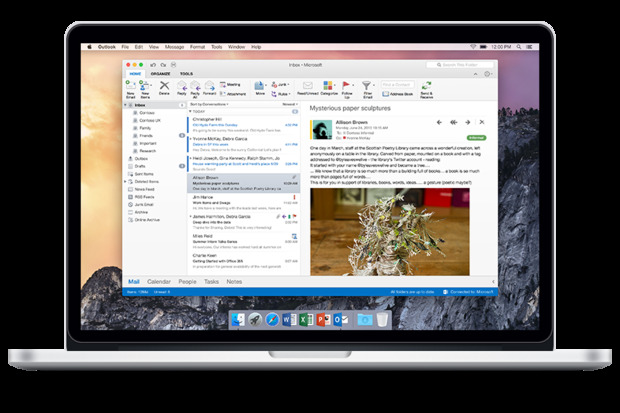 This is good news for Mac users, because the new interface and features, as well as the improved performance of Outlook, make it a considerably better suite. And it should also mean that Office on the Mac will no longer trail behind its Windows counterpart, and will be updated on a similar schedule. In fact, the final Mac version of Office 2016 was released before the Windows version, which won’t be available until later in September. But there’s something even more important than the release schedule about this latest iteration of Office for the Mac: It’s a winner. Any Mac user looking for an office suite should seriously consider getting it.